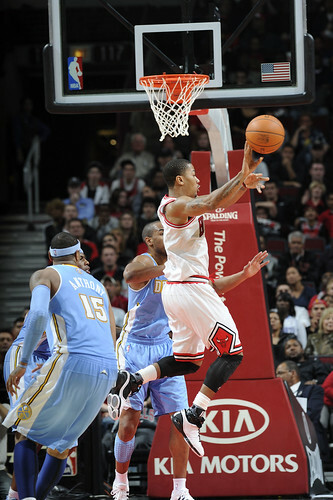 The Bulls on Monday with Joakim Noah and Taj Gibson, but without Carlos Boozer, defeated the Denver Nuggets at the United Center 94-92. Say the Bulls traded Joakim Noah, as the Nuggets most prefer, for Anthony, who led Denver with 32 points, though just six in the fourth quarter? I say the Nuggets win that one, given Noah continued his amazing early season run with 13 points and 19 rebounds, now leading the NBA in double-doubles with six and averaging 15 points and 15.7 rebounds. So give that one to the Bulls for not giving into temptation in exchange for one of the premier scorers in the NBA as Noah had just eight fewer rebounds than the entire Nuggets starting five and that was with center Nene back from injury. OK, what if the Nuggets were to take Luol Deng, who had 17 points and seven rebounds, and Taj Gibson, who had 16 points, six rebounds and five blocks, along with a couple of firsts and perhaps Omer Asik for Anthony? 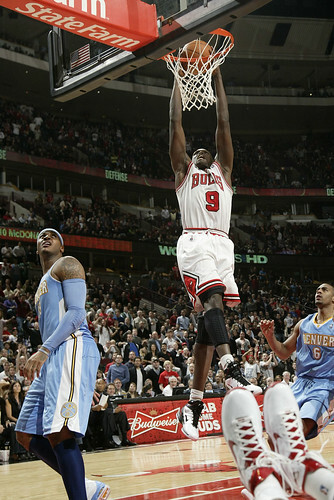 Anthony impressed the Chicago crowd, which gave him a warm greeting and to which Anthony expressed some surprise, with a scoring burst that no Bulls player possesses with 10 straight points late in the third quarter to wipe out a 68-58 Bulls lead in the midst of a 19-2 run that gave the Nuggets a 77-70 lead just over a minute into the fourth quarter. Especially a three pointer and 22 footer to close the third in which you couldn’t stick a trade rumor between Deng and Anthony and Anthony still made the shot. He may be the best pure shotmaker in the NBA today. So, no Gibson and no Deng, but Anthony to the Bulls. 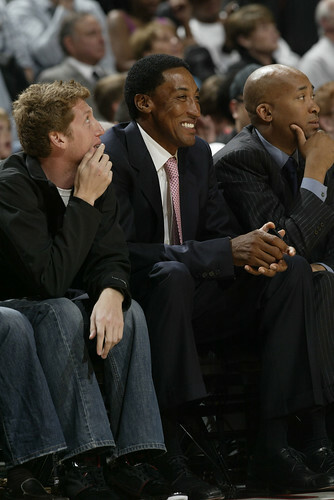 The Bulls probably win that game as Chauncey Billups isn’t near the player he was and committed a pair of turnovers in the last minute that proved fatal to the Nuggets. 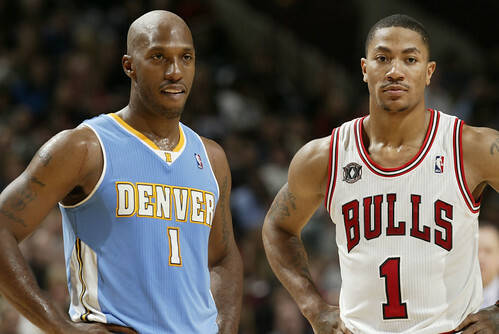 As for Anthony, earlier in the day he, likewise, said anyone would want to play with Rose, though he also could see himself staying in Denver. Yes, those lies again, as we got last season from LeBron and Bosh and Wade as they trailed around pretending to be interested in so many places despite seeming to have their plans long made. The Nuggets left Chicago after the game for a back to back in Indianapolis, and I suspect that’s the final time we’ve seen Anthony in Chicago in a Nuggets uniform. 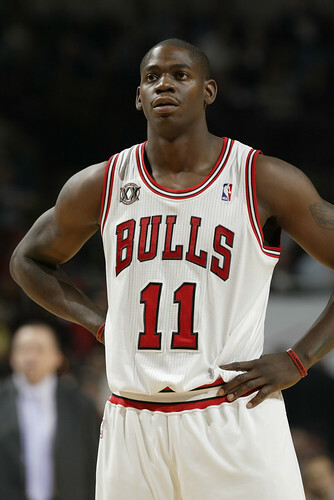 Though I could see him back in the United Center in the last regular season game in a Nets uniform. 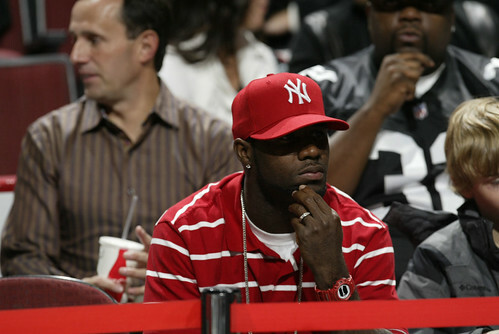 His agent, Leon Rose, along with famed William “World Wide Wes” Wesley, who was the guy whispering all last season LeBron would come to Chicago, sat courtside with Scottie Pippen, who often offered the same belief. After all, how could LeBron not? It’s not as easy with Anthony, who will be a free agent after this season. He could play it out and sign with the Knicks or Nets, said to be his top two choices despite what he says about Denver, though the Bulls still have slim hopes Denver will find a Bulls package without Noah acceptable and Anthony will really be about winning than celebrity. The general belief is his representatives have been telling him you go to New York or New Jersey and then Chris Paul becomes a free agent after next season and joins you with Amar’e Stoudemire or Brook Lopez and that’s enough to take down Miami. But if you really wanted to win wouldn’t you prefer Noah, Rose and Boozer? It makes you wonder about Anthony. Though LeBron as well. Actually, I still hear that from disbelieving GM’s around the NBA who say they cannot believe LeBron didn’t go with Rose, Noah and his choice of power forwards rather than Miami without a point guard and center. Chicago was the place. Could it be the deep dish pizza and 16-inch softball? I’m not fond of either, as well. But I wouldn’t expect to see Anthony with Rose and Noah. Still, it was another most entertaining game as for the last seven minutes neither team ever led by more than four. Both teams had four point leads in that stretch as the Bulls kept coming after falling behind 77-70 to start the fourth with their bench, which also sent the Bulls behind 36-25 early in the second after the Bulls trailed 28-23 after one. Bulls coach Tom Thibodeau, who can’t seem to find a reserve rotation that can maintain, did say he was more pleased with the reserves this time given their tenacity after getting down again. The Bulls were fine then as Rose began to hit those creases again and get to the basket and finally dropped a three late after a tough start when he stayed on the outside and shot one of seven in the first quarter. Rose ended with six assists, my favorite on a little one/two action where Aaron Afflalo jumped out to head off Rose with Billups trailing. Ronnie Brewer dove into the lane and Rose found him with a laser before the defense could rotate for a dunk and 82-82 tie with 5:12 left. Noah then went to work dominating the inside with seven fourth quarter rebounds (the Nuggets entire team had eight) and three blocks, the first then on a Melvin Ely layup attempt. The Nuggets retook the lead with an Afflalo drive and Brewer was fouled and made one of two. Brewer continues to come on and contribute, looking a bit more athletic and closer to advertised, but Keith Bogans had his best game of the season with 10 points with a pair of threes and four rebounds and the play of the game. With the Bulls ahead 86-84 after Rose hit a runner over Anthony on a switch (I’ll get back to that), Bogans stole a Ty Lawson pass, dribbled down court and with the defense closing flipped over his head behind his back to a finishing Deng for an 88-84 lead with 2:30 left. I’m not sure I’d fully go there, but Bogans with 10 and Brewer with seven, at least on this night, offset Afflalo with 15. It looked like the Bulls were going to put the game away after a Rose pullup with 1:08 left for a 90-86 lead when Billups made consecutive turnovers. 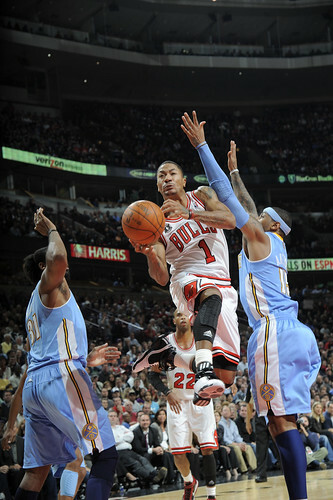 But the Bulls botched consecutive fast breaks, giving Denver a chance and they almost stole back the game. Anthony then forced himself into the basket with 15.3 seconds left for a layup, the kind of power move only the great scorers can do, to get the Nuggets within 90-88. Deng was throwing the ball in. The Nuggets overplayed Rose and Kyle Korver, so Noah slipped open and seemed to have a lane to the basket. Deng threw it to him, but Noah couldn’t finish and was fouled. Not exactly the guy you want shooting your game clinching free throws, though Noah did come into the game, amazingly, shooting a team best 81 percent on free throws. He made one of two for a three point lead. It is remarkable, really, given that twisting, no rotation shot and where Noah came from that he can be at the line at that time and no one is that upset. Though, as Thibodeau said, it wasn’t the plan. The Bulls then fouled Anthony on the throw in, a bit soon, I thought, to avoid the tying three and Anthony made both with 11 seconds left to bring the Nuggets back within one. The Nuggets then fouled Korver with 8.5 seconds left and he made both. Giving the Nuggets a chance for a tying three, and they almost got it. 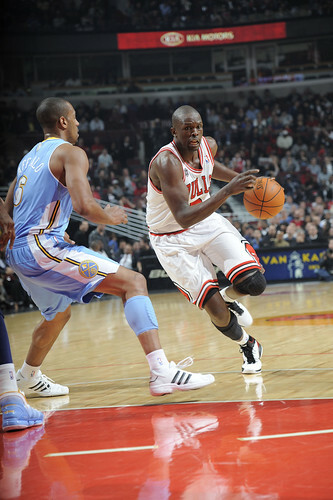 The Nuggets play small and Thibodeau went with C.J. Watson, who got picked off as Afflalo, shooting 47 percent on threes coming in, got an open look from the left corner. 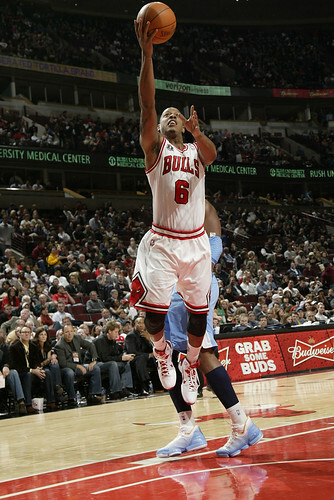 But it went long with a second left and the Bulls rebounded to effectively end the game when Deng hit a free throw. 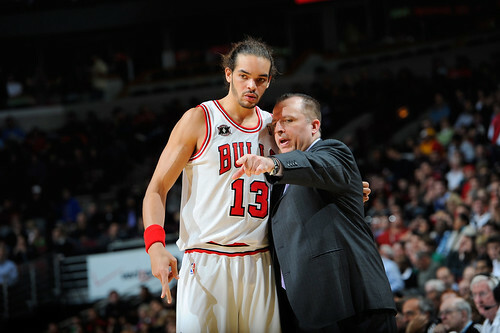 “They got a shot at the end that we would rather they did not get,” conceded Thibodeau. But the Bulls escaped, and it was vital, not only to stand up to Anthony, but to get back to .500 at 3-3 with the Western trip looming next week. One more thing about Anthony. 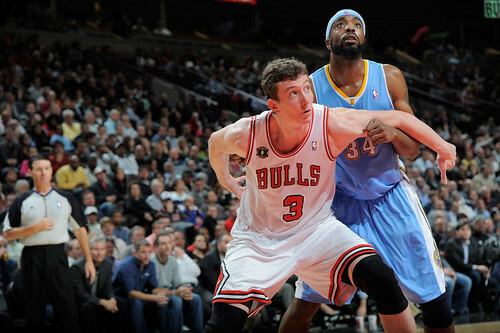 He can score and is a true game finisher, one of the best in the NBA, something Rose isn’t quite yet. Plus, Anthony gets to the line. 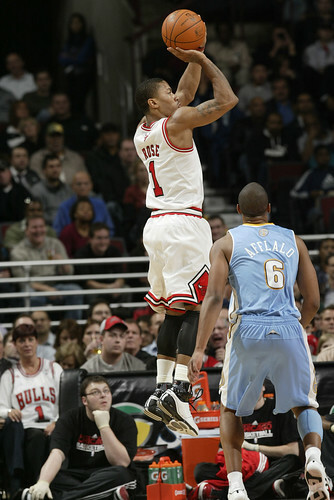 And it surely would help Rose to have someone else on the perimeter to create a shot on his own. But you can take advantage of Anthony when the Nuggets switch, which they do often, and I don’t think the Bulls did that enough. Anthony did have eight rebounds and four steals in a better defensive effort, but it can be spotty. 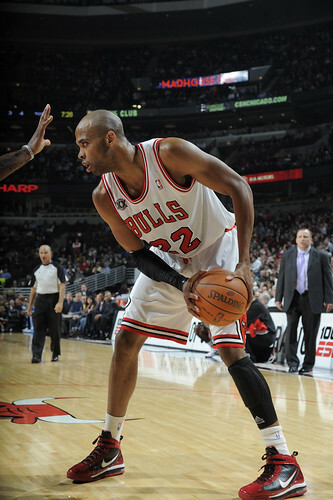 Meanwhile, though he gets overlooked in the excitement and attention over the play of Rose and Noah, Taj Gibson has been the biggest and most important surprise of the early season. Gibson had an awful preseason still battling that plantar fasciitis from last season, which doesn’t appear to be going away any time soon, as well as personal tragedies. He also seemed somewhat overlooked by the team the way Boozer just walked into the starting power forward spot, though Gibson took the move to the reserve unit with grace, as he deals with everything. Did it hurt? You’d never know or hear it from him. But he’s been the X-factor this season with his shooting, which has been shockingly improved after a summer in which he admitted he took some short cuts. With Boozer out, defenses have quickly developed a plan against Rose, to wall him off with multiple defender in that obvious theory of we’ll let someone else beat us. Let’s see if they can. Rose has been a bit flummoxed at times with the strategy and has given in, at least in my view, a bit much. He’s allowed the big man in the pick and roll to stay with him and he’s surrendered the ball a bit too quickly sometimes. After all, he has to make plays. But as terrific as he is, he usually figures it out and by the end of the game was taking over and hitting the seams. And he’s still not getting the calls he should. Yes, he sways away from contact a bit too much sometimes. But he takes a beating going to the rim with two and three guys slapping at his arm. You never see anyone in the NBA have to cover the ball like a running back against the Bears to hang onto it. And he still doesn’t get calls. I hate to complain about that stuff as it never helps much, but now three years in you’d have to say he’s not getting the same treatment as players of his level. But as those defenses have been converging on Rose, he’s been doing a good job of finding Gibson along the weak side baseline, where Gibson has become an impressively deadly shooter, the Bulls best mid range shooter this season. Which is impressive for a guy who last season was only about 65 percent on free throws. 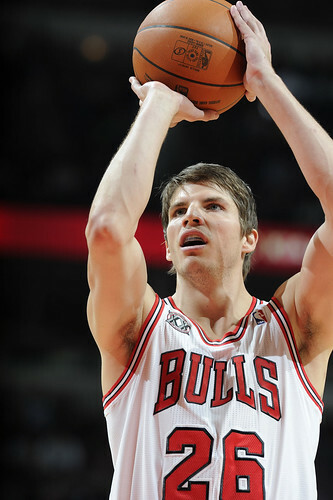 Gibson was huge in the second quarter when the Bulls stormed into the lead and got the Bulls going after that flat opening to the fourth with a baseline 16 footer. The Bulls got things going when they finally began to get in transition, but the offense still bogs down a bit in the halfcourt as the movement isn’t what it was even in the preseason. Though defenses are better in season. The Bulls haven’t done quiet enough to exploit the attention toward Rose with perhaps a second pass after Rose’s, say to Gibson, to a cutter into the paint. Though the way Gibson is shooting, it’s not that needed for now. Gibson is shooting 63 percent from the field and averaging 15.2 points. You could begin to make a case he’s one of the league’s most improved players after averaging nine points on less than 50 percent shooting last season. Gibson hadn’t shot less than 60 percent in any game this season until Monday when he was seven of 12, 58 percent. So would you give up, even if you could, Deng and Gibson and another player and a pair of firsts for Anthony? The Nuggets don’t seem, at least for now, to even feel that is enough. And so we’ll get to consider it again in about two and a half weeks when the Bulls are in Denver and Anthony most likely still is there. For now, edge Bulls.